– reduce unplanned down time. 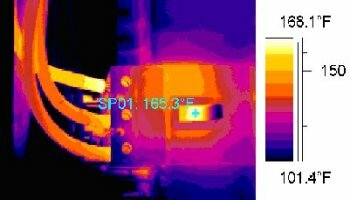 Infrared testing can reveal conditions, such as the loose connection shown above, which may cause component failure. Schedule non-emergency repairs during normal work hours. Identify system problems that warrant attention. Lower operating and repair costs. Atlantic Electric, LLC uses state of the art Flir Thermal Imaging Cameras operated with ITC Certified Thermographers. A complete report is printed for your review showing an Infrared thermal photograph next to a digital photograph with recommended repair procedures. Our highly trained staff are also trained electricians that can make most minor repairs on the spot. Don’t be fooled with competitors that use inexpensive thermal lasers that often miss hot spots and are very inaccurate. Call our service line for more information (843) 460-1200. Samples of what an infrared photo scan can find. This picture shows an overloaded 225 amp circuit breaker. The current load was 218 amps. This circuit breaker is part of an emergency backup system. This photo shows where a loose screw on a starter buss strap was causing an excessive heat buildup. We repaired the problem before it could damage the starter. This photo shows overloaded and badly corroded knife switches in a disconnect. This photo indicates where there was a loose connection on the breaker. This was taken only two weeks after the panel was installed. This photo shows three old 2400 volt knife switches with the one on the right having already exploded. We replaced all three switches with new ones immediately. This photo was part of a roof survey conducted in Myrtle Beach, South Carolina. It shows water seepage from the HVAC penetration. The owners could not determine where the leak originated. This photo was for an engineering study to determine the validity of the amount of grout in the block walls. It was determined that the general contractor did not install grout in every third cell as they were contracted to do.